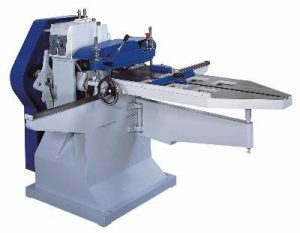 It performs cut off, burrs trimming, and moulding functions. Two 4″ D x 5″ L max. tenon cutters, cope spindle accepts general shaper cutter. Suited for cutting tenons, finger joints for window or doorframe and general joint-tenon. Hand, manual operated clamping and feeding of stock. First the trim saw to cut off the end of stock evenly. Then two moulding, tenon spindles are mounted at the rear of saw enable machine performs edge moulding. Since each head is adjusted independently, a wide variety of tenon can be cut. At the end the cope spindle provides 6000 RPM cutting which allows it to feature a spindle sharper function. All operations can be accomplished in a single pass of feeding, high efficiency is assured. Powerful industrial motor for maximun cutting capacity.